Expectations of a nail biting finish and close race in the Wisconsin recall effort of Republican Governor Scott Walker were quickly dashed this evening as from the first reports after the polls closed, Governor Walker jumped to a commanding lead, 22 points at one stage over Democrat rival, Milwaukee Mayor Tom Barrett. Within moments of the first reports, Twitter accounts and facebook pages lit up with the exciting news of such a stunning victory for conservatives and Governor Walker, making him the first Governor to survive a recall effort. Also surviving the union backed recall effort was Lt. Gov. Rebecca Kleefisch and four state Senate seats, although one Senate seat remains too close to call in Racine County. Governor Walker, speaking to an overflow crowd at the same party said, “Tonight we tell Wisconsin, we tell our country, and we tell people all across the globe that voters really do want leaders that stand up and make the tough decisions,” adding, “Tomorrow is the day after the election and tomorrow we are no longer opponents. 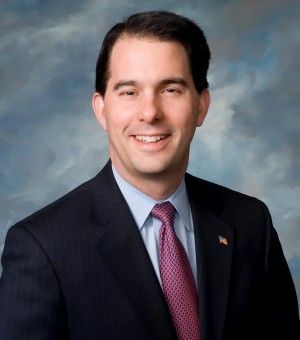 We are one as Wisconsinites,” reminding supporters that it will take all working together to continue the improvements seen since he won the Governor’s race last year. Throughout the day came reports and allegations of fraud from both sides, but mostly against union backed Democrats, alleging busing in of voters from out of state, confrontations at polling places as questions rose of questionable residency and an effort by Democrats to keep some polls open well passed the 8 O’clock deadline. Unconfirmed reports came early of a robo-call calling on Democrats to stay home, their signature on the recall petition being counted as a vote cast. The Chicago Sun Times sees Walker’s reform efforts as a resounding success. As can be expected, many Democrats and union supporters are not pleased, seeing all of their efforts at usurping the recovery by asking them to “pay their fair share” as well fizzle out in such a resounding loss. Sorry Ed, with 95% of precincts reporting, Walker remains well ahead with a comfortable 54% to 46% lead. Even King County Washington would have difficulty “discovering” enough misplaced ballots to overcome that lead, some 180,000 votes at the time of this posting. Voters seeing Obama’s dismal economic record compared to Walker’s common sense reforms, provided Romney embraces them over the establishment GOP policies may just say different in November. Likewise, presumed GOP Gubernatorial candidate for Washington State, Rob McKenna would be wise to reconsider his earlier distancing from Governor Walker, seeing what voters are really seeking in a candidate for Governor. That is a view shared by the other GOP candidate for Washington State Governor, Shahram Hadian who is ready, willing and able to follow Governor Walkers example and lead our state out of the ‘Great Recession’ we remain mired in. It’s now up to you to keep the momentum growing and take our country back and restore her to the greatness she has known. As Goes Wisconsin, So Will The Rest of America?